MgCl2 crystallizes in the cadmium chloride motif, which features octahedral Mg centers. Several hydrates are known with the formula MgCl2(H2O)x, and each loses water at higher temperatures: x = 12 (−16.4 °C), 8 (−3.4 °C), 6 (116.7 °C), 4 (181 °C), 2 (about 300 °C). 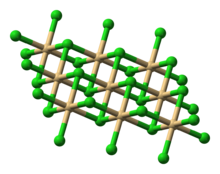 In the hexahydrate, the Mg2+ is also octahedral, but is coordinated to six water ligands. The thermal dehydration of the hydrates MgCl2(H2O)x (x = 6, 12) does not occur straightforwardly. Anhydrous MgCl2 is produced industrially by heating the chloride salt of hexammine complex [Mg(NH3)6]2+. As suggested by the existence of some hydrates, anhydrous MgCl2 is a Lewis acid, although a weak one. It can also be prepared from magnesium carbonate by a similar reaction. Derivatives with tetrahedral Mg2+ are less common. Examples include salts of (tetraethylammonium)2MgCl4 and adducts such as MgCl2(TMEDA). This process is practiced on a substantial scale. Magnesium chloride is one of many substances used for dust control, soil stabilization, and wind erosion mitigation. When magnesium chloride is applied to roads and bare soil areas, both positive and negative performance issues occur which are related to many application factors. Ziegler-Natta catalysts, used commercially to produce polyolefins, contain MgCl2 as a catalyst support. The introduction of MgCl2 supports increases the activity of traditional catalysts and allowed the development of highly stereospecific catalysts for the production of polypropylene. Magnesium chloride is used for low-temperature de-icing of highways, sidewalks, and parking lots. When highways are treacherous due to icy conditions, magnesium chloride helps to prevent the ice bond, allowing snow plows to clear the roads more efficiently. 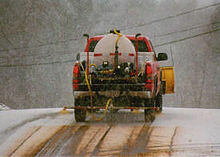 Magnesium chloride is used in three ways for pavement ice control: Anti-icing, when maintenance professionals spread it onto roads before a snow storm to prevent snow from sticking and ice from forming; prewetting, which means a liquid formulation of magnesium chloride is sprayed directly onto salt as it is being spread onto roadway pavement, wetting the salt so that it sticks to the road; and pretreating, when magnesium chloride and salt are mixed together before they are loaded onto trucks and spread onto paved roads. Calcium chloride damages concrete twice as fast as magnesium chloride. Magnesium chloride is used in nutraceutical and pharmaceutical preparations. Magnesium chloride (E511) is an important coagulant used in the preparation of tofu from soy milk. 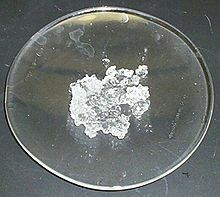 In Japan it is sold as nigari (にがり, derived from the Japanese word for "bitter"), a white powder produced from seawater after the sodium chloride has been removed, and the water evaporated. In China, it is called lushui (卤水). Nigari or lushui consists mostly of magnesium chloride, with some magnesium sulfate and other trace elements. It is also an ingredient in baby formula milk. Because magnesium is a mobile nutrient, magnesium chloride can be effectively used as a substitute for magnesium sulfate (Epsom salt) to help correct magnesium deficiency in plants via foliar feeding. The recommended dose of magnesium chloride is smaller than the recommended dose of magnesium sulfate (20 g/l). This is due primarily to the chlorine present in magnesium chloride, which can easily reach toxic levels if over-applied or applied too often. It has been found that higher concentrations of magnesium in tomato and some pepper plants can make them more susceptible to disease caused by infection of the bacterium Xanthomonas campestris, since magnesium is essential for bacterial growth. Magnesium values in natural seawater are between 1250 and 1350 mg/l, around 3.7% of the total seawater mineral content. Dead Sea minerals contain a significantly higher magnesium chloride ratio, 50.8%. Carbonates and calcium are essential for all growth of corals, coralline algae, clams, and invertebrates. Magnesium can be depleted by mangrove plants and the use of excessive limewater or by going beyond natural calcium, alkalinity, and pH values. Magnesium ions are bitter-tasting, and magnesium chloride solutions are bitter in varying degrees, depending on the concentration of magnesium. Magnesium toxicity from magnesium salts is rare in healthy individuals with a normal diet, because excess magnesium is readily excreted in urine by the kidneys. A few cases of oral magnesium toxicity have been described in persons with normal renal function ingesting large amounts of magnesium salts, but it is rare. If a large amount of magnesium chloride is eaten, it will have effects similar to magnesium sulfate, causing diarrhea, although the sulfate also contributes to the laxative effect in magnesium sulfate, so the effect from the chloride is not as severe. Chloride (Cl−) and magnesium (Mg2+) are both essential nutrients important for normal plant growth. Too much of either nutrient may harm a plant, although foliar chloride concentrations are more strongly related with foliar damage than magnesium. High concentrations of MgCl2 ions in the soil may be toxic or change water relationships such that the plant cannot easily accumulate water and nutrients. Once inside the plant, chloride moves through the water-conducting system and accumulates at the margins of leaves or needles, where dieback occurs first. Leaves are weakened or killed, which can lead to the death of the tree. The presence of dissolved magnesium chloride in the well water (bore water) used in locomotive boilers on the Trans-Australian Railway caused serious and expensive maintenance problems during the steam era. At no point along its route does the line cross a permanent freshwater watercourse, so bore water had to be relied on. No inexpensive treatment for the highly mineralised water was available, and locomotive boilers were lasting less than a quarter of the time normally expected. In the days of steam locomotion, about half the total train load was water for the engine. The line's operator, Commonwealth Railways, was an early adopter of the diesel-electric locomotive. ^ Holleman, A. F.; Wiberg, E. Inorganic Chemistry Academic Press: San Diego, 2001. ISBN 0-12-352651-5. ^ Hill, Petrucci, McCreary, Perry, General Chemistry, 4th ed., Pearson/Prentice Hall, Upper Saddle River, New Jersey, USA. ^ "Dust Palliative Selection and Application Guide". Fs.fed.us. Retrieved 2017-10-18. ^ Norio Kashiwa (2004). "The Discovery and Progress of MgCl2-Supported TiCl4 Catalysts". Journal of Polymer Science A. 42: 1–8. doi:10.1002/pola.10962. ^ Jain, J., Olek, J., Janusz, A., and Jozwiak-Niedzwiedzka, D., "Effects of Deicing Salt Solutions on Physical Properties of Pavement Concretes", Transportation Research Record: Journal of the Transportation Research Board, No. 2290, Transportation Research Board of the National Academies, Washington, D.C., 2012, pp. 69-75. doi:10.3141/2290-09. ^ Food Standard Agency. "Current EU approved additives and their E Numbers". Retrieved 22 March 2010. ^ "Listed under ingredients for Similac Hypoallergenic Infant Formula with Iron (Abbott Nutrition)". abbottnutrition.com. Retrieved 2013-07-22. ^ "Comparison of Magnesium Sulfate and THIS Mg Chelate Foliar Sprays". Pubs.aic.ca. 1970-01-01. Retrieved 2017-10-18. ^ "Magnesium Chloride Toxicity in Trees". Ext.colostate.edu. Retrieved 2017-10-18. ^ "Effect of Foliar and Soil Magnesium Application on Bacterial Leaf Spot of Peppers" (PDF). Retrieved 2017-10-18. ^ "Aquarium Chemistry: Magnesium In Reef Aquaria — Advanced Aquarist | Aquarist Magazine and Blog". Advancedaquarist.com. 2003-10-15. Retrieved 2013-01-17. ^ "Publications – ExtensionExtension". Ext.colostate.edu. Archived from the original on 2015-09-24. Retrieved 2017-10-18. ^ "Overland Locomotive:Feed Water Problems". The Argus. 1927-03-21. Retrieved 2014-03-11.